Antonín Leopold Dvořák (/d(ə)ˈvɔːrʒɑːk, -ʒæk/ d(ə)-vor-ZHA(h)k; Czech: [ˈantoɲiːn ˈlɛopolt ˈdvor̝aːk]; 8 September 1841 – 1 May 1904) was a Czech composer, one of the first to achieve worldwide recognition. Following the Romantic-era nationalist example of his predecessor Bedřich Smetana, Dvořák frequently employed rhythms and other aspects of the folk music of Moravia and his native Bohemia. Dvořák's own style has been described as "the fullest recreation of a national idiom with that of the symphonic tradition, absorbing folk influences and finding effective ways of using them". Dvořák displayed his musical gifts at an early age, being an apt violin student from age six. The first public performances of his works were in Prague in 1872 and, with special success, in 1873, when he was aged 31. Seeking recognition beyond the Prague area, he submitted a score of his First Symphony to a prize competition in Germany, but did not win, and the unreturned manuscript was lost until rediscovered many decades later. In 1874 he made a submission to the Austrian State Prize for Composition, including scores of two further symphonies and other works. Although Dvořák was not aware of it, Johannes Brahms was the leading member of the jury and was highly impressed. The prize was awarded to Dvořák in 1874[a] and again in 1876 and in 1877, when Brahms and the prominent critic Eduard Hanslick, also a member of the jury, made themselves known to him. Brahms recommended Dvořák to his publisher, Simrock, who soon afterward commissioned what became the Slavonic Dances, Op. 46. These were highly praised by the Berlin music critic Louis Ehlert in 1878, the sheet music (of the original piano 4-hands version) had excellent sales, and Dvořák's international reputation was launched at last. Dvořák was born in Nelahozeves near Prague, in the Austrian Empire, and was the eldest son of František Dvořák (1814–94) and his wife, Anna, née Zdeňková (1820–82). František worked as an innkeeper, a professional player of the zither, and a butcher. Anna was the daughter of Josef Zdeněk, the bailiff of the Prince of Lobkowicz. Anna and František married on 17 November 1840. Dvořák was the first of fourteen children, eight of whom survived infancy. Dvořák was baptized as a Roman Catholic in the village's church of St. Andrew. Dvořák's years in Nelahozeves nurtured his strong Christian faith and the love for his Bohemian heritage that so strongly influenced his music. In 1847, Dvořák entered primary school and was taught to play violin by his teacher Joseph Spitz. He showed early talent and skill, playing in a village band and in church. František was pleased with his son's gifts. At the age of 13, through the influence of his father, Dvořák was sent to Zlonice to live with his uncle Antonín Zdenĕk in order to learn the German language. His first composition, the Forget-Me-Not Polka in C (Polka pomněnka) was written possibly as early as 1855. Dvořák took organ, piano, and violin lessons from his German-language teacher Anton Liehmann. Liehmann also taught the young boy music theory and introduced him to the composers of the time; Dvořák had much regard for Liehmann despite his teacher's violent temper. Liehmann was the church organist in Zlonice and sometimes let Antonín play the organ at services. Dvořák took further organ and music theory lessons at Česká Kamenice with Franz Hanke, who encouraged his musical talents even further and was more sympathetic. At the age of 16, through the urging of Liehmann and Zdenĕk, František allowed his son to become a musician, on the condition that the boy should work toward a career as an organist. After leaving for Prague in September 1857, Dvořák entered the city's Organ School, studying singing with Josef Zvonař, theory with František Blažek, and organ with Joseph Foerster. The latter was not only a professor at the Prague Conservatory, but also a composer for the organ; his son Josef Bohuslav Foerster became a better known composer. Dvořák also took an additional language course to improve his German and worked as an "extra" violist in numerous bands and orchestras, including the orchestra of the St. Cecilia Society. Dvořák graduated from the Organ School in 1859, ranking second in his class. He applied unsuccessfully for a position as an organist at St. Henry's Church, but remained undaunted in pursuing a musical career. In 1858, he joined Karel Komzák's orchestra, with whom he performed in Prague's restaurants and at balls. The high professional level of the ensemble attracted the attention of Jan Nepomuk Maýr, who engaged the whole orchestra in the Bohemian Provisional Theater Orchestra. Dvořák played viola in the orchestra beginning in 1862. Dvořák could hardly afford concert tickets, and playing in the orchestra gave him a chance to hear music, mainly operas. In July 1863, Dvořák played in a program devoted to the German composer Richard Wagner, who conducted the orchestra. Dvořák had had "unbounded admiration" for Wagner since 1857. In 1862, Dvořák had begun composing his first string quartet. In 1864, Dvořák agreed to share the rent of a flat located in Prague's Žižkov district with five other people, who also included violinist Mořic Anger and Karel Čech, who later became a singer. In 1866, Maýr was replaced as chief conductor by Bedřich Smetana. Dvořák was making about $7.50 a month. The constant need to supplement his income pushed him to give piano lessons. It was through these piano lessons that he met his future wife. He originally fell in love with his pupil and colleague from the Provisional Theater, Josefína Čermáková, for whom he apparently composed the song-cycle "Cypress Trees". However, she never returned his love and ended up marrying another man. In 1873 Dvořák married Josefina's younger sister, Anna Čermáková (1854–1931). They had nine children together, three of whom died in infancy. Dvořák called his String Quintet in A minor (1861) his Opus 1, and his First String Quartet (1862) his Opus 2, although the chronological Burghauser Catalogue numbers these as B.6 and B.7, showing five earlier compositions without opus numbers. In the early 1860s, Dvořák also made his first symphonic attempts, some of which he self-critically burned. The manuscript of a symphony in C minor without opus number, B.9, composed in 1865, was preserved. This symphony has come to be numbered as Dvořák's First (see under "Works"). His first composing attempts passed without critical reception or public performances. His compositions up through 1870, according to the Burghauser Catalogue either had no known premieres, or were premiered in 1888 or later. For example, the Third String Quartet, B.18, was written in about 1869 but first published in 1964 and premiered in 1969. In 1870, he composed his first opera, Alfred, over the course of five months from May to October. Its overture was first publicly performed as late as 1905, and the full opera only in 1938. In 1871 Dvořák left the Provisional Theatre orchestra to have more time for composing. Up through 1871 Dvořák only gave opus numbers up to 5 among his first 26 compositions. The first press mention of Antonín Dvořák appeared in the Hudební listy journal in June 1871, and the first publicly performed composition was the song Vzpomínání ("Reminiscence", October 1871, musical evenings of L. Procházka). The opera The King and the Charcoal Burner was returned to Dvořák from the Provisional Theatre and said to be unperformable. Its overture was premiered in 1872 in a Philharmonic concert conducted by Bedřich Smetana, but the full opera with the original score only in 1929. Clapham says Dvořák realized he had gone to "extremes in attempting to follow the example of Wagner". In 1873–74 he reset "the King and Charcoal Burner libretto entirely afresh, in a totally different manner", without using "anything from the ill-fated earlier version". The alternate opera, called King and Charcoal Burner II, B.42, was premiered in Prague in 1874. On leaving the National Theater Orchestra after his marriage, Dvořák secured the job of organist at St. Vojtěch, also called St. Adalbert's, Church in Prague under Josef Foerster, his former teacher at the Organ School. The job paid "a mere pittance", but it was "a welcome addition for the young couple". Despite these circumstances, Dvořák still managed to compose a substantial body of music around this time. In November 1872, Dvořák's Piano Quintet in A major, Op. 5, was performed in Prague, by a "splendid team of players" organized by Procházka. It was his first piece played in a concert. In March 1873, his Czech patriotic cantata The Heirs of the White Mountain was performed by the Prague Hlahol Choral Society of 300 singers (conducted by his friend and supporter Karel Bendl) to a warm response from both audience and critics, making it an "unqualified success". Dvořák's compositions were first coming to be recognized in Prague. When Dvořák turned age 33 in 1874, however, he remained almost unknown as a composer outside the area of Prague. 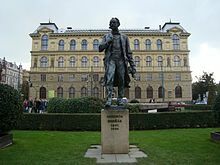 That year, he applied for and won the Austrian State Prize ("Stipendium") for composition, awarded in February 1875 by a jury consisting of the critic Eduard Hanslick, Johann Herbeck, director of the State Opera, and Johannes Brahms. It seems that Brahms had only recently joined the jury, as he was not on it during the calendar year of 1874, according to Hanslick. Hanslick had first-hand knowledge, as a continuing member of the jury (from at least 1874 to 1877). Nevertheless, Brahms had time and opportunity to appreciate Dvořák's 1874 submission. Botstein says that the jury's purpose was "to award financial support to talented composers in need" in the Austro-Hungarian Empire. The jury received a "massive submission" from Dvořák: "fifteen works including two symphonies, several overtures and a song cycle". Brahms was "visibly overcome" by the "mastery and talent" of Dvořák. The two symphonies were Dvořák's third and fourth, both of which had been premiered in Prague in the spring of 1874. In 1875, the year his first son was born, Dvořák composed his second string quintet, his 5th Symphony, Piano Trio No. 1, and Serenade for Strings in E. He again entered but this time did not win the Austrian State Prize. He did win it in 1876, and finally felt free to resign his position as an organist. In 1877 he wrote the "Symphonic Variations" and Ludevít Procházka conducted its premiere in Prague. Dvořák entered the Austrian Prize competition again in 1877, submitting his Moravian Duets and other music, possibly his Piano Concerto. He did not learn the outcome until December. Then, he received a personal letter from the music critic Eduard Hanslick, who had also been on the juries awarding the prizes. The letter not only notified Dvořák that he had again won the prize, but made known to him for the first time that Brahms and Hanslick had been on the jury. The letter conveyed an offer of friendly assistance of the two in making Dvořák's music known outside his Czech motherland. Within the month December 1877, Dvořák wrote his String Quartet No. 9 in D minor and dedicated it to Brahms. Both Brahms and Hanslick had been much impressed by the Moravian Duets, and Brahms recommended them to his publisher, Simrock, who published them with success. Having in mind Brahms's well-received Hungarian Dances, Simrock commissioned Dvořák to write something of the same nature. Dvořák submitted his Slavonic Dances, Op. 46 in 1878, at first for piano four hands, but when requested by Simrock, also in an orchestral version. These were an immediate and great success. On 15 December 1878, the leading music critic Louis Ehlert published a review of the Moravian Duets and Slavonic Dances in the Berlin "Nationalzeitung", saying that the "Dances" would make their way "round the world" and "a heavenly naturalness flows through this music". "There was a run on the German music shops for the dances and duets of this hitherto... unknown composer." The dances were played in 1879 in concerts in France, England, and the United States. Later Simrock requested further Slavonic Dances, which Dvořák supplied in his Op. 72, 1886. In 1879 Dvořák wrote his String Sextet. Simrock showed the score to the leading violinist Joseph Joachim, who with others premiered it in November of that year. Joachim became a "chief champion" of Dvořák's chamber music. In that same year, Dvořák also wrote his Violin Concerto. In December he dedicated the piece to Joachim and sent him the score. The next spring the two discussed the score and Dvořák revised it extensively, but Joachim was still not comfortable with it. The concerto was premiered in Prague in October 1883 by the violinist František Ondříček, who also played it in Vienna with conductor Hans Richter in December of that year. Twice later, Joachim was scheduled to play the concerto, but both times the arrangements fell through and he never did play it. Hans Richter asked Dvořák to compose his Symphony No. 6 for the Vienna Philharmonic, intending to premiere it in December 1880. However, Dvořák later discovered that, despite this intention, members of the orchestra objected to performing works by the composer in two consecutive seasons, due to "anti-Czech feeling". Adolf Čech therefore conducted the premiere of the symphony at a concert of the Philharmonia society (in Czech: spolek Filharmonie, predecessor of the Czech Philharmonic) on 25 March 1881, in Prague. Richter did eventually conduct the piece in London in 1882 and always retained an interest in Dvořák's compositions. Dvořák's Stabat Mater (1880) was performed and very well received at the Royal Albert Hall in London on 10 March 1883, conducted by Joseph Barnby. The success "sparked off a whole series of performances in England and the United States", a year ahead of appreciation in Germany and Austria. Dvořák was invited to visit Britain where he appeared to great acclaim in 1884. The London Philharmonic Society commissioned Dvořák to conduct concerts in London, and his performances were well received there. In response to the commission, Dvořák wrote his Symphony No. 7 and conducted its premiere at St. James's Hall on 22 April 1885. On a visit later in 1885, Dvořák presented his cantata The Spectre's Bride, in a concert on 27 August. He had arrived a week early to conduct rehearsals of the chorus of 500 voices and orchestra of 150. The performance was "a greater triumph than any" Dvořák "had had in his life up to that time...following this phenomenal success, choral societies in the English-speaking countries hastened to prepare and present the new work." Dvořák visited Britain at least eight times in total, conducting his own works there. In 1887, Richter conducted the Symphonic Variations in London and Vienna to great acclaim (they had been written ten years earlier and Dvořák had allowed them to languish after initial lack of interest from his publishers). Richter wrote to Dvořák of the London performance, "at the hundreds of concerts I have conducted during my life, no new work has been as successful as yours." Despite Dvořák's newfound success, a February 1888 performance of Stabat Mater in Vienna fell victim to more anti-Czech feeling and what the composer called "destructive criticism". He heartily thanked Richter for his "courage and devoted sympathy". In 1890, influenced by Pyotr Ilyich Tchaikovsky, Dvořák also visited Russia, and conducted performances of his music in Moscow and St. Petersburg. In 1891, Dvořák received an honorary degree from the University of Cambridge, and was offered a position at the Prague Conservatory as professor of composition and instrumentation. At first he refused the offer, but then later accepted; this change of mind was seemingly a result of a quarrel with his publisher Simrock over payment for his Eighth Symphony. Dvořák's Requiem was premiered later that year in Birmingham at the Triennial Music Festival. In 1891 the Bohemian String Quartet, later called the Czech Quartet, was founded, with Karel Hoffmann, first violin, Josef Suk, second violin, Oskar Nedbal, viola, and Otakar Berger, cello. It is said that Nedbal and Suk had been two of Dvořák's "most promising" students at the Conservatory and took the initiative in founding the Quartet. As of 1891 Dvořák had written 11 string quartets, six of which had been premiered, and these were available as part of the repertory of the Quartet on tour, as were the two quartets of Smetana. From 1892 to 1895, Dvořák was the director of the National Conservatory of Music in New York City. He began at a then-staggering $15,000 annual salary. Emanuel Rubin describes the Conservatory and Dvořák's time there. The Conservatory had been founded by Jeannette Thurber, a wealthy and philanthropic woman, who made it open to women and black students as well as white men, which was unusual for the times. Dvořák's original contract provided for three hours a day of work, including teaching and conducting, six days a week, with four months’ vacation each summer. The Panic of 1893, a severe economic depression, depleted the assets of the Thurber family and other patrons of the Conservatory. In 1894 Dvořák's salary was cut to $8000 per year and moreover was paid only irregularly. The Conservatory was located at 126–128 East 17th Street,[b] but was demolished in 1911 and replaced by what is today a high school. In the winter and spring of 1893, Dvořák was commissioned by the New York Philharmonic to write Symphony No. 9, From the New World, which was premiered under the baton of Anton Seidl, to tumultuous applause. Clapham writes that "without question this was one of the greatest triumphs, and very possibly the greatest triumph of all that Dvořák experienced" in his life, and when the Symphony was published it was "seized on by conductors and orchestras" all over the world. Dvořák's New York home was located at 327 East 17th Street, near the intersection of what is today called Perlman Place. [c] It was in this house that both the B minor Cello Concerto and the New World Symphony were written within a few years. Despite protests, from Czech President Václav Havel amongst others, who wanted the house preserved as a historical site, it was demolished in 1991 to make room for a Beth Israel Medical Center residence for people with AIDS. 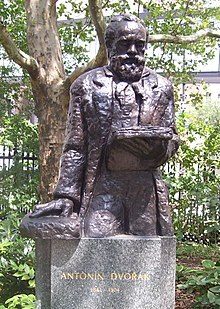 To honor Dvořák, however, a statue of him was erected in nearby Stuyvesant Square. Brahms continued to try to "clear a path for" Dvořák, "the only contemporary whom he considered really worthy". While Dvořák was in America, Simrock was still publishing his music in Germany, and Brahms corrected proofs for him. Dvořák said it was hard to understand why Brahms would "take on the very tedious job of proofreading. I don’t believe there is another musician of his stature in the whole world who would do such a thing." 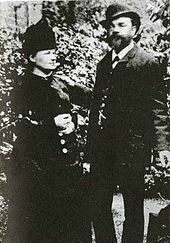 Dvořák returned from the United States on 27 April 1895 with his wife and Otakar Berger, and took care to avoid spreading the news about his return. However, after a performance of Dimitrij at the National Theater on 19 May, Dvořák fled to the family country cottage in Vysoká. Dvořák's first love and later sister-in-law, Josefina Kaunitzová, née Čermáková, died in May 1895. He and she had maintained friendly relations over the years. After her death he revised the coda of his Cello Concerto in her memory. During Dvořák's final years, he concentrated on composing opera and chamber music. In November 1895, he resumed his professorship at the Prague Conservatory. Between 1895 and 1897, he completed his string quartets in A-flat major and G major, and also worked on the cycle of symphonic poems inspired by the collection Kytice by Karel Jaromír Erben. As seen in Burghauser's 1960 Catalogue, Dvořák wrote his five Symphonic Poems in 1896, but after that completed few works per year, mainly operas: Jakobín in 1896, nothing in 1897, only The Devil and Kate in 1898–99, Rusalka in 1900, two songs and "Recitatives" in 1900/01, and finally the opera Armida in 1902–03. Rusalka became the most popular of all Dvořák's ten operas and gained an international reputation (below under Works, Operas). In 1896 he visited London for the last time to conduct the premiere of his Cello Concerto in B minor by the London Philharmonic. Also in 1896, Brahms tried to persuade Dvořák, who had several children, to move to Vienna. Brahms said he had no dependents and "If you need anything, my fortune is at your disposal". Clapham writes "Dvořák was deeply moved and tears came to his wife's eyes, but it was quite impossible for him, a Czech, to contemplate leaving Bohemia." Brahms himself had little time left to live, as he died 3 April 1897. Also, Brahms hoped to gain an ally in Vienna to "counterbalance the influence of" Bruckner. In 1897 Dvořák's daughter Otilie married his student, the composer Josef Suk. In the same year, Dvořák visited Brahms on his deathbed and attended his funeral on 6 April 1897. In November Dvořák was appointed a member of the jury for the Viennese Artists’ Stipendium. He was informed in November 1898 that Emperor Franz Joseph I of Austria-Hungary would award him a gold medal for Litteris et Artibus, the ceremony taking place before an audience in June 1899. On 4 April 1900 Dvořák conducted his last concert with the Czech Philharmonic, performing Brahms’ Tragic Overture, Schubert's "Unfinished" Symphony, Beethoven's 8th Symphony. and Dvořák's own symphonic poem The Wild Dove. In April 1901, The Emperor appointed him a member of the Austro-Hungarian House of Lords, along with the leading Czech poet Jaroslav Vrchlický. [d] Dvoŕák also succeeded Antonín Bennewitz as director of the Prague Conservatory from November 1901 until his death. Dvořák's 60th birthday was celebrated as a national event. First, around the actual date, six of his operas and the oratorio St. Ludmila were performed in Prague, but Dvořák was away in Vienna; then in November 1901 came the "postponed official birthday party... In many towns all over Bohemia and Moravia, the Czech people celebrated his birthday." Dvořák had an "attack of influenza" on 18 April and died on 1 May 1904, of an undiagnosed cause[e] following five weeks of illness, at the age of 62, leaving many unfinished works. His funeral service was held on 5 May, and his ashes were interred in the Vyšehrad cemetery in Prague, beneath a bust by Czech sculptor Ladislav Šaloun. Many of Dvořák's compositions, such as the Slavonic Dances and his large collection of songs, were directly inspired by Czech, Moravian, and other Slavic traditional music. As the basis for his works, Dvořák frequently used Slavic folk dance forms including the skočná; the Bohemian odzemek, furiant, sousedská, and špacirka; the Polish mazurka and polonaise; the Yugoslav Kolo; and folk song forms of Slavic peoples, including the Ukrainian dumka. His 16 Slavonic Dances, Op. 46, which first brought him a wide reputation, and Op. 72, include at least one of each of these forms. He also wrote an orchestral Polonaise (1879). He named the third movement of his 6th Symphony as "Scherzo (Furiant)". His Dumky Trio is one of his best-known chamber works, and is named for the Dumka, a traditional Slavic and Polish genre. His major works reflect his heritage and love for his native land. Dvořák followed in the footsteps of Bedřich Smetana, the creator of the modern Czech musical style. Dvořák had been an admirer of Wagner's music since 1857. Late in life, he said that Wagner "was so great a genius that he was capable of doing things that were beyond the reach of other composers". Wagner especially influenced Dvořák's operas, but also some orchestral pieces. According to Clapham, the theme of the Andante Sostenuto from his fourth symphony "could almost have come directly out of Tannhäuser". From 1873 on, Dvořák's style was "moving steadily in the direction of classical models". To be more specific about "classical models", in 1894 Dvořák wrote an article in which he said the composers of the past he admired most were Bach, Mozart, Beethoven and Schubert. As the article was specifically on Schubert, three years in advance of the centennial of Schubert's birth, it seems Dvořák had a special predilection toward Schubert. While a large number of Dvořák's works were given opus numbers, these did not always bear a logical relationship to the order in which they were either written or published. To achieve better sales, some publishers such as N. Simrock preferred to present budding composers as being well established, by giving some relatively early works much higher opus numbers than their chronological order would merit. In other cases, Dvořák deliberately provided new works with lower opus numbers to be able to sell them outside contract obligations to other publishers. An example is the Czech Suite which Dvořák didn't want to sell to Simrock, and had published with Schlesinger as Op. 39 instead of Op. 52. In this way it could come about that the same opus number was given to more than one of Dvořák's works; for example the opus number 12, which was assigned, successively, to: the opera King and Charcoal Burner (1871), the Concert Overture in F (1871, derived from the opera), the String Quartet No. 6 in A minor (1873), the Furiant in G minor for piano (1879), and the Dumka in C minor for piano (1884). In yet other cases, a work was given as many as three different opus numbers by different publishers. All of Dvořák's works were catalogued chronologically by Jarmil Burghauser. As an example, in the Burghauser catalogue, the New World Symphony, Op. 95, is B.178. Scholars today often refer to Dvořák's works by their B numbers (for Burghauser), partly because many early works do not have opus numbers. References to the traditional opus numbers are still common, in part because the opus numbers have historical continuity with earlier scores and printed programs. The opus numbers are still more likely to appear in printed programs for performances. With their broadly lyrical style and accessibility to the listener, Dvořák's symphonies seem to derive from the Schubertian tradition; but, as Taruskin suggests, the great difference was Dvořák's use of "cyclic" form, especially in his later symphonies (and indeed concertos), whereby he "occasionally recycled themes from movement to movement to a degree which lent his works a tinge of secret 'programmaticism'". Symphony No. 1 in C minor, Op. 3, was written in 1865 when Dvořák was 24 years old. [n 1] It was later subtitled The Bells of Zlonice, in reference to the time Dvořák spent in the village of Zlonice, and in the church there, between the age of 13 and 16. Like the Symphony No. 2 in B-flat major, Op. 4,[n 2] also in 1865, it is, despite touches of originality, too wayward to maintain a place in the standard symphonic repertory. Symphony No. 5 in F major, Op. 76,[n 5] and Symphony No. 6 in D major, Op. 60,[n 6] are largely pastoral in nature. The Sixth, published in 1880, shows a resemblance to the Symphony No. 2 of Brahms, particularly in the outer movements, but not so much in the third-movement furiant, a vivid Czech dance. This was the symphony that made Dvořák internationally known as a symphonic composer. Symphony No. 7 in D minor of 1885, Op. 70,[n 7]. Symphony No. 9 in E minor, Op. 95,[n 9] is also known by its subtitle, From the New World, or as the New World Symphony. Dvořák wrote it between January and May 1893, while he was in New York. At the time of its first performance, he claimed that he used elements from American music such as spirituals and Native American music in this work, but he later denied this. Reacting to American racism, he wrote in an article published in the New York Herald on 15 December 1893, "[In the 9th symphony] I have simply written original themes embodying the peculiarities of the Indian music." Neil Armstrong took a recording of the New World Symphony to the Moon during the Apollo 11 mission, the first Moon landing, in 1969, and in 2009 it was voted the favourite symphony in a poll run by ABC Classic FM in Australia. Many conductors have recorded cycles of the symphonies, including Karel Ančerl, István Kertész, Rafael Kubelík, Otmar Suitner, Libor Pešek, Zdeněk Mácal, Václav Neumann, Witold Rowicki, Jiří Bělohlávek, and Neeme Järvi. Antonín Dvořák composed his Requiem in 1890, at the beginning of the peak period of his career. Dvořák was a deeply religious man, and this work reflects his faith and spirituality. The premiere of the work took place on 9 October 1891 in Birmingham, conducted by Dvořák himself, and was "very successful". It had an outstanding success in Boston 30 November 1892: "the composer was frequently applauded between numbers and given a most enthusiastic ovation at the end.". 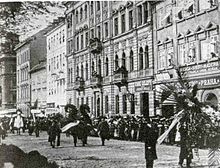 In Vienna it was greeted, belatedly, in 1901: "The Vienna performance in March 1901 was a triumph of Dvořák's music, as if the Viennese public wished thereby to make up for their earlier, sometimes cool reception of his works." The oratorio Saint Ludmila was a huge success in Bohemia and Moravia, sung at events in Dvořák's honor in 1901 and 1904. Its text, in Czech, may have limited its audience among non-Czech speakers. The piece had a considerable success in England in October 1886, with an audience on the 15th "in raptures... the critics praised the music in the warmest terms", and on the 29th, there was a "large and equally enthusiastic audience, and once again the critics were full of praise", but a drawback was that the libretto, specifically its translation into English, was "regarded on all sides as unsatisfactory". The Concerto for Cello and Orchestra in B minor, Op. 104 was the last composed of Dvořák's concerti. He wrote it in 1894–1895 for his friend the cellist Hanuš Wihan. Wihan and others had asked for a cello concerto for some time, but Dvořák refused, stating that the cello was a fine orchestral instrument but completely insufficient for a solo concerto. Dvořák composed the concerto in New York while serving as the Director of the National Conservatory. In 1894 Victor Herbert, who was also teaching at the Conservatory, had written a cello concerto and presented it in a series of concerts. Dvořák attended at least two performances of Victor Herbert's cello concerto and was inspired to fulfill Wihan's request for a cello concerto. Dvořák's concerto received its premiere in London on 16 March 1896, with the English cellist Leo Stern. The reception was "enthusiastic". Brahms said of the work: "Had I known that one could write a cello concerto like this, I would have written one long ago!" Agreeing with Schonberg, the cellist and author Robert Battey wrote "I believe it to be the greatest of all cello concertos...an opinion shared by most cellists". A compiler of discographies of Dvořák's music wrote that his is the "king" of cello concertos. In 1865, early in his career, Dvořák had composed a Violoncello concerto in A major with Piano accompaniment, B. 10. Günter Raphael in 1925–1929 produced a revised and orchestrated version. Dvořák's cataloguer Jarmil Burghauser made another orchestration and abridgement, published in 1975. Of all his operas, only Rusalka, Op. 114, which contains the well-known aria "Měsíčku na nebi hlubokém" ("Song to the Moon"), is played on contemporary opera stages with any frequency outside the Czech Republic. This is attributable to their uneven invention and libretti, and perhaps also their staging requirements – The Jacobin, Armida, Vanda and Dimitrij need stages large enough to portray invading armies. The song cycle of 10 Biblical Songs, Op. 99, B. 185, was written in March 1894. Around that time Dvořák was informed of the death of the famous conductor, and his close personal friend, Hans von Bülow. Just a month earlier, he had been grieved to hear that his father was near death, far away in Bohemia. Dvořák consoled himself in the Psalms. The resulting work, considered the finest of his song cycles, is based on the text of the Czech Bible of Kralice. As fate would have it, his father expired 28 March 1894, two days after the completion of the work. From other important works, that show also the influence of Czech folk music, both in terms of rhythms and of melodic shapes, perhaps the best known examples are the two sets of Slavonic Dances, written in two series. The first book, Op. 46 (1878), is predominantly Czech in respect to the forms represented. They were created for piano duet (one piano, four hands), but Dvořák proceeded to orchestrate the entire set, completing that version the same year. The second book, Op. 72 (also composed originally for piano four hands), which came along eight years later, includes forms native to such other Slavic lands as Serbia, Poland and Ukraine, although some "merge characteristics of more than one dance". Dvořák did not use actual folk tunes in his dances, but created his own themes in the authentic style of traditional folk music, using only rhythms of original folk dances. 1980 film Concert at the End of Summer is based on Dvořák's life. Dvořák was played by Josef Vinklář. 2012 television film The American Letters focuses on Dvořák's love life. Dvořák is played by Hynek Čermák [cs]. Asteroid 2055 Dvořák, discovered by Luboš Kohoutek is named in his honor. Professional wrestling stable Ringkampf (Progress, Westside Xtreme Wrestling) use Dvorak's New World Symphony as their entrance music. ^ In 1899 Franz Joseph had decreed that the Czech language could no longer be used in local administration or law courts. This was much resented, and he hoped to placate the Czechs by the appointments. ^ There was no autopsy, nor were the symptoms clear. ^ Clapham 1980, p. 765. ^ a b c Clapham 1979b, p. 60. ^ a b Burghauser 1960 or later ed., "Survey of the life of" A.D.
^ Clapham 1979b, pp. 132–33. ^ a b Taruskin 2010, p. 754. ^ Hughes 1967, pp. 22–23. ^ Clapham 1979a, p. 3. ^ Hughes 1967, p. 24. ^ Clapham 1979a, p. 23. ^ Burghauser 1960, p. 466. ^ Burghauser 1966, pp. 49–50. ^ Clapham 1979b, p. 12. ^ Burghauser 1960, p. 468. ^ Honolka 2004, pp. 14–16. ^ Josef Bohuslav Förster at Encyclopædia Britannica. ^ "Foerster", Kasika, Czech music . ^ Smaczny, Jan, "Foerster, Josef Bohuslav", in Oxford Companion to Music, Alison Latham, Ed., Oxford University Press, 2002, pp. 468–69. ^ Schönzeler 1984, pp. 36–38. ^ Schönzeler 1984, p. 39. ^ Clapham 1979b, p. 20. ^ Clapham 1979a, p. 5. ^ Clapham 1979b, pp. 21–22. ^ a b Clapham 1979b, p. 17. ^ a b Clapham 1979b, p. 21. ^ Hughes 1967, p. 35. ^ a b c Clapham 1979b, p. 23. ^ Clapham 1979b, p. 24. ^ a b Burghauser 1960, p. 77. ^ Schönzeler 1984, p. 46. ^ Clapham 1979b, p. 25. ^ From a set, "Songs to words by Eliška Krásnohorská", B.23 in Burghauser 1960. ^ Burghauser 1960, pp. 106–08, B.21. ^ Clapham 1979b, p. 29. ^ Burghauser 1960, pp. 131–33. ^ Clapham 1979b, p. 30. ^ Clapham 1979b, p. 26. ^ This piece, sometimes called Hymnus, is B.27 in the Burghauser (1960) Catalogue. Dvořâk did not give it an opus number. ^ a b Clapham 1979b, p. 27. ^ Clapham 1979b, p. 35. ^ Botstein, Leon. "Admiration and emulation: the friendship of Brahms and Dvorák". Retrieved 16 January 2014. ^ Clapham 1979b, p. 36 is "certain" that these two were included. ^ Clapham 1979b, pp. 35–36. ^ Clapham 1979b, p. 39. ^ a b Clapham 1979b, p. 42. ^ Clapham 1979b, p. 44. ^ Clapham 1979b, p. 46. ^ a b Clapham 1979b, p. 49. ^ Clapham 1979b, pp. 63, 68. ^ Clapham 1979b, p. 53; 71 in UK. ^ Burghauser, Jarmil; Joachimová, Zoja (translation) (2003). Dvořák: Symphonies 4-5-6 (sleevenote) (CD) (in Czech). Václav Neumann, Czech Philharmonic Orchestra. Prague: Supraphon. p. 5. SU 3704-2 032. ^ Layton 1978, pp. 30–31. ^ Brown 2003a, p. 373. ^ Steinberg 1995, p. 140. ^ Steinberg 1995, pp. 140–41. ^ a b Clapham 1979b, p. 77. ^ Clapham 1979b, p. 85. ^ Clapham 1979b, p. 89. ^ Burghauser 2006, p. 82 "Dvořákova rodina s přáteli na dvoře domu v New Yorku v roce 1893 [zleva manželka Anna, syn Antonín, Sadie Siebertová, Josef Jan Kovařík, matka Sadie Siebertové, dcera Otilie, Antonín Dvořák]." ^ a b c d Cooper, Michael (23 August 2013), "The Deal that Brought Dvorak to New York", The New York Times . ^ a b Naureckas, Jim (13 June 2006), "Seventeenth Street", New York Songlines . ^ De Lerma, Dominique-René, "Essay", African Heritage Symphonic Series, Cedille Records, I, Dram online, Liner note, CDR055 . ^ Clapham 1979b, p. 132. ^ Clapham 1979b, pp. 112–13. ^ Clapham 1979b, pp. 119–20. ^ a b c Burghauser 1960, p. 322. ^ Horowitz, Joseph (10 February 2002). "Music; Czech Composer, American Hero". The New York Times. Retrieved 3 November 2007. In 1991, the New York City Council was petitioned by Beth Israel Hospital to permit the demolition of a small row house at 327 East 17th Street, once the home of Antonín Dvořák. ^ "Dvorak's Homecoming, With Music", The New York Times (editorial), 7 September 1997 (concerning when the house was removed). ^ "Topics of the Times, The New World at City Hall", The New York Times (editorial), 23 June 1991 (concerning the circumstances under which the house was removed). ^ a b Gál 1971, p. 151. ^ Schönzeler 1984, p. 174. ^ Clapham 1979b, pp. 70–71. ^ Burghauser 1960, p. 574. ^ a b c Clapham 1979b, p. 150. ^ Burghauser 1960, p. 580. ^ a b Burghauser 1960, p. 590. ^ Clapham 1979b, p. 154 he calls the medal "an outstanding honour". ^ Clapham 1979b, p. 161. ^ Honolka 2004, pp. 108–09, "[the appointment was ceremonial, with] management handled by... Karel Knittl." ^ Honolka 2004, p. 109. ^ a b Burghauser 1960, p. 603. ^ Zemanová 2002, p. 112. ^ Burghauser 1960, p. 604. ^ Schönzeler 1984, p. 194. ^ Clapham 1979b, pp. 172–73. ^ Clapham 1979b, p. 31. ^  (from The Century Illustrated Monthly Magazine, Vol. XLVIII, No. 3 (July 1894), pp. 341–46. ^ a b c Clapham 1980, p. 778. ^ "African American Influences". DVOŘÁK AMERICAN HERITAGE ASSOCIATION. ^ Smithee, Alan (22 March 2006). "Dvorak Symphony no 9: From the New World". Crowndozen.com. Archived from the original on 4 December 2007. ^ "Search - Classic 100 Archive - ABC Classic FM". 11 November 2017. ^ Edward Rothstein (24 March 1992). "Review/Music; The American Symphony Takes On a New Role". New York Times. Retrieved 6 August 2008. ^ van der Velden, Hans (February 2011). "Stabat mater dolorosa". ^ Burghauser, Jarmil. Requiem (Sleeve note). Karel Ančerl and the Czech Philharmonic. Retrieved 7 September 2015. ^ a b Šourek et al. 1976, p. xi. ^ Clapham 1979b, p. 117. ^ "Mše D dur" (in Czech). Nibiru-publishers.com. ^ Clapham 1979b, pp. 81–82. ^ Clapham 1979b, p. 149. ^ Burghauser 1960, pp. 91–92. ^ Clapham (1966, reprinted 1969), p. 167. ^ "en/string-quartet3 - antonin-dvorak.cz". www.antonin-dvorak.cz. . English language version of a Czech site including details of all Dvorak's works. ^ Clapham 1969, p. 163. ^ Smaczny 2003, p. 370. ^ Smaczny 2003, pp. 370–71. ^ Smaczny 2003, pp. 378–80. ^ Smaczny 2003, p. 380. ^ "Koncert na konci léta (1979)". Czech and Slovak Film Database (in Czech). Retrieved 9 February 2018. ^ "Americké dopisy (TV film) (2015)". Czech and Slovak Film Database (in Czech). Retrieved 9 February 2018. ^ "(2055) Dvořák". (2055) Dvořák In: Dictionary of Minor Planet Names. Springer. 2003. p. 166. doi:10.1007/978-3-540-29925-7_2056. ISBN 978-3-540-29925-7. ——— (2003). New Worlds of Dvořák: Searching in America for the Composer's Inner Life. New York: W.W. Norton & Co. ISBN 978-0-393-04706-6. Beckerman, Michael (1 December 1992). "Henry Krehbiel, Antonín Dvořák, and the Symphony 'From the New World'". Notes. 49 (2): 447–73. doi:10.2307/897884. JSTOR 897884. Brown, A. Peter (2003b). "Part 1". The Symphonic Repertoire. 3. Bloomington: Indiana University Press. pp. 410–36. ISBN 978-0-253-33488-6. ——— (1960) [Export Artia 1960, Bārenreiter Supraphon 1966, 1996], Antonin Dvořák Thematický Katalog [Thematic Catalogue] (in Czech), Prague: Bārenreiter Supraphon , notes in German and English. Bibliography co-edited by Dr. John Clapham and Dr. W. Pfannkuch, and a Survey of Life and Work. If there is a reference to one edition and the reader has access only to another edition, the catalogue numbers such as B.178 for the New World Symphony will be more useful than page numbers. In the chronology of Dvořák's life, one may search by year (and date) rather than page number. Butterworth, Neil (1980). Dvořák, his life and times. Midas Books. ISBN 978-0-859-36142-2. Clapham, John (1979a) [St. Martin’s Press or Faber & Faber 1966, MacMillan reprint ISBN 0-333-23111-2 or St. Martin’s, ISBN 0-31204515-8, 1969], Antonín Dvořák, Musician and Craftsman, London: Newton Abbot (England), David & Charles, ISBN 978-0-7153-7790-1 templatestyles stripmarker in |origyear= at position 61 (help). ——— (1980), "Dvořák, Antonín (Leopold)", in Sadie, Stanley (ed. ), The New Grove Dictionary of Music and Musicians, 5, London: MacMillan, pp. 765–92, ISBN 978-0-333-23111-1 . Horowitz, Joseph (2003). Dvořák in America: In Search of the New World. Cricket Books. ISBN 978-0-812-62681-0. Hurwitz, David (2005). Dvořák: Romantic Music's Most Versatile Genius. Unlocking the Masters. Milwaukee: Amadeus Press. ISBN 978-1-574-67107-0. Peress, Maurice (2004). Dvorák to Duke Ellington: A Conductor Explores America's Music and Its African American Roots. New York: Oxford University Press. ISBN 978-0-19-509822-8. Raeburn, Michael; Kendall, Alan, eds. (1990) . Heritage of Music. III: The Nineteenth Century Legacy. Oxford University Press. ISBN 9780195053722. Schönzeler, Hans-Hubert (1984). Dvořák. London, New York: Marion Boyars Publishers. ISBN 978-0-7145-2575-4. Smaczny, Jan (2003). "Grand Opera Amongst the Czechs". In Charlton, David (ed.). The Cambridge Companion to Grand Opera. Cambridge Companions to Music. Cambridge: Cambridge University Press. pp. 366–82. ISBN 978-052-164683-3. Steinberg, Michael (1995). The Symphony: A Listener's Guide. Oxford: Oxford University Press. ISBN 978-0-19-506177-2. Tibbets, John C., ed. (1993). Dvořák in America. Portland, OR: Amadeus Press. ISBN 978-0-931340-56-7. "Discovering Dvořák". BBC Radio 3.